The Best Microsoft Windows Blogs from thousands of Microsoft Windows blogs in our index using search and social metrics. We’ve carefully selected these websites because they are actively working to educate, inspire, and empower their readers with frequent updates and high-quality information. Redmond, WA About Blog Follow this official blog for Windows and Devices at Microsoft to get in depth knowledge on Windows. Facebook fans 46,989,497. Twitter followers 472,087. USA About Blog Windows Central is a leading resource for those interested in all things Microsoft. The Windows Central team covers news, reviews, and opinions about all things Microsoft and Windows related, from Windows Phones and PCs to Microsoft Surface, Band, Xbox, Hololens and everything in between. Facebook fans 386,751. Twitter followers 370,596. United States About Blog Follow this blog to stay tuned on MSFT (Microsoft) news, as well as the latest on Windows 10, Surface, Office, Mobile, Xbox, and everything Microsoft. Facebook fans 18,639. Twitter followers 20,979. Bucharest, Romania About Blog Windows Report covers Windows 10 and Microsoft related news to bring you Windows tips, how-to advice and top notch solutions to get the best out of your Windows software. Facebook fans 1,280. Twitter followers 30. USA About Blog Windows Latest provides all the latest news and reviews of Microsoft, Windows, Windows Phone, Surface and Xbox devices. Facebook fans 3,913. Twitter followers 1,261. Nashville, Tennessee About Blog AskWoody blog contains Woody Leonhard's no-bull news, tips and help for Windows, Office and more. Facebook fans 699. Twitter followers 1,833. About Blog This blog is for users of the Microsoft Windows Operating System, it contains tips, tricks and secrets for both beginner and expert users. About Blog The Windows Incident Response Blog is dedicated to the myriad information surrounding and inherent to the topics of IR and digital analysis of Windows systems. This blog provides information on "Windows Forensic Analysis 2/e", "Windows Registry Forensics", "Windows Forensic Analysis Toolkit 3/e" and much more. Facebook fans n/a. Twitter followers 762. About Blog The Windows Club is targeted at the Windows 10/8/7 user and addresses issues and covers topics that will interest a Microsoft follower and a Windows user. It offers Windows 10/8/7 Tips, Tricks, Help, Support, Tutorials, News, Features & more. Facebook fans 51,607. Twitter followers 14,073. About Blog Microsoft Most Valued Professionals are real world experts and community leaders in their respective fields. Brink is a one of the Microsoft Most Valued Professionals. Follow this blog where he shares his opinions and information on Windows. About Blog Hello and welcome to Winaero.com - a resource where you will find the best tweaks, tips and tricks for Microsoft Windows. It makes using your PC and mastering Windows easy for you - we have excellent tutorials, high quality free apps and themes with HD desktop backgrounds for you to enjoy. Facebook fans 9,022. Twitter followers 800. About Blog The Microsoft Windows UI Automation blog covers topics related to the Windows Automation API. Follow this blog to get the latest information, insights, announcements, and news from Microsoft experts and developers about Windows UI Automation. San Francisco, CA About Blog Windows is a personal computer operating system released by Microsoft as part of the Windows NT family of operating systems. This Reddit community discusses all things related to Windows. Facebook fans 1,187,124. Twitter followers 556,240. San Francisco, CA About Blog This Reddit community is dedicated to all things related to Windows 10 which is a personal computer operating system released by Microsoft as part of the Windows NT family of operating systems. Facebook fans 1,187,125. Twitter followers 556,240. About Blog Follow this blog to get guidance on the Latest Windows Server Product Information. Facebook fans 171,896. Twitter followers 168,539. About Blog KMSpico is an activation tool for lifetime activation of your Windows and Office product. KMS Activator is a great program that you can use to activate windows or office, and unlock all premium features. Kmspico2k.com is one of those most popular blog where you can get latest updates about Kmspico activator. Facebook fans 381. Twitter followers 32. UK About Blog All About Windows Phone is a website that aims to bring you all the information you need in Windows Phone. Facebook fans 2,369. Twitter followers 4,673. About Blog Windows Phone Area provides daily Windows and Microsoft news, fresh and useful articles on Windows 10 updates, apps and new devices along with tips, tricks and how-to articles. Facebook fans 1,301. Twitter followers 12,059. Melbourne, Australia About Blog In Windows System Admin's Blog John shares things that happen in the day to day life of a Microsoft Systems Administrator and a helping hand in overcoming a few problems that he has experienced. It also covers Server Administration, Endpoint Management, Scripting, Network Management and much more. About Blog Windows Administrators blog is managed by the Windows and VMware Administrator by profession. Main goal with the blog is to educate, share, inform and discuss about the various new technologies and troubleshoot methodology implemented for a timely solution. Facebook fans 6,712. Twitter followers 7. About Blog Follow this blog to get resources and articles on Windows 10. About Blog We are Aditya & Naman a student, Learner & seeker of Information Technology. As you know the name of our blog getawareofwindows, as name as work, we've created this blog just to be aware and to make aware people about windows. Here you will get new tricks, old tricks, hidden features & all you really need. 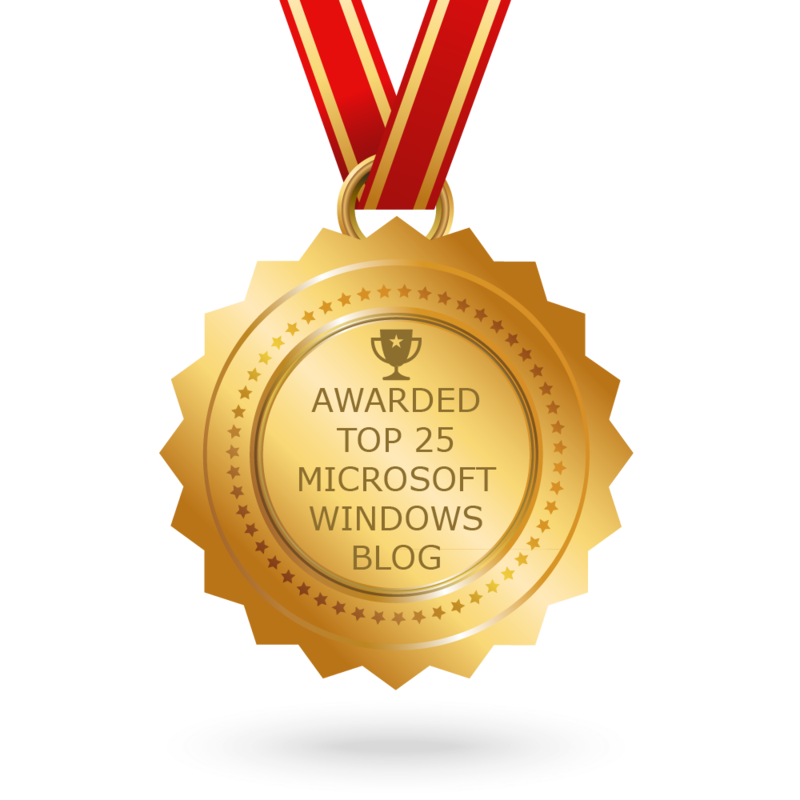 CONGRATULATIONS to every blogger that has made this Top Microsoft Windows Blogs list! This is the most comprehensive list of best Microsoft Windows blogs on the internet and I’m honoured to have you as part of this! I personally give you a high-five and want to thank you for your contribution to this world.